Heirloom Quality Furniture | Amish Originals Furniture Co.
Memories are a part of us. They allow us to remember the good times, times of laughter and joy with family and friends. Our homes are where those memories often are built and Amish Originals will help you furnish your home with heirloom quality furniture to help make those memories. Over 70 of the best Amish artisans in Ohio have partnered with us here at Amish Originals to bring you the highest quality heirloom furniture possible. Each piece is handcrafted in the homes and small workshops of these artisans; often with several generations of the family working together. With no mass production or assembly lines, each piece comes together under the skilled hands of the Amish craftsmen. When you buy heirloom quality furniture from Amish Originals, you are not only buying a functional, handmade piece for your home, you are buying a work of art. Since 1992, Amish Originals has been providing you with heirloom quality furniture. Our furniture is designed with not only functionality in mind but beauty as well. 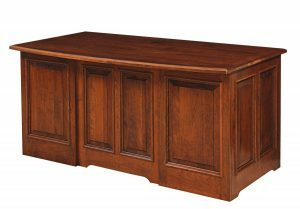 Because we use 100% American hardwood in our heirloom quality furniture, each piece is unique with its own wood grain design. Whether it’s gathering with friends to watch a movie or sitting down to a family dinner, our heirloom quality furniture is made to be passed down; making memories and connections from generation to generation. Build a family legacy today with heirloom quality furniture from Amish Originals. To learn more about what we offer, browse our products, visit our showroom in Westerville, Ohio or contact us directly. Our staff is happy to work with you to find the perfect heirloom quality furniture to complete your home.